Masterpiece is a term all too often bandied about to describe films which, though good, often have that elusive ingredient missing. The Lorax however, justifies the use of the word 100% as it has that missing element in spades (though admittedly you just can’t put your finger on what it is). This big screen version of one of the most popular stories by cult American children’s author Dr Seuss is one of the most beguiling ninety minutes of animation you’re ever likely to see. Seldom do the elements of graphics, story and characterisation come together in such a sublime mix which completely envelopes the viewer for its entire duration. Twelve year old Ted (voiced by Zac Efron) lives in the town of ‘Thneed-Ville’ where everything is fake, with no trees or vegetation and where fresh air is sold in bottles by the megalomaniac business man Mr O’Hare (Rob Riggle), who holds the town under his steely grip. But Ted is a feisty boy and, after Audrey (Taylor Swift), the girl he is secretly infatuated with, tells him that she’d fall in love with any boy who could bring her a real tree, he determines to find one in order to win her hand. Sneaking from ‘Thneed-Ville’ one night, Ted sets off to find the mysterious Once-ler (Ed Helms) who lives in the wastelands outside the town. This reclusive person holds the secret as to what became of all the trees and to the identity of the Lorax (Danny DeVito), the mythical guardian of the land beyond the walls of ‘Thneed-Ville’. The Lorax, produced by the team behind Despicable Me (2010), is one of those rare films where everything just comes together. Though primarily aimed at children, the surreal animation which brings the wacky imagination of Theodor Seuss Geisel to the screen, will equally stir adults who remember his tales from childhood. Coloured in an array of vibrant acids and bleak monochromes the new production is probably the nearest visualisation to date of the sinister world of Seuss’ bewitching morality tales. The film also contains all the elements required to make it a classic. With the voice talents of Hollywood legends like DeVito and Betty White (as Ted’s mischievous Grammy Norma), and a universal moral to the story which will resonate with everyone in today’s consumer obsessed culture, this fable will last long after the regular crop of kid’s cartoon capers have faded from the collective memory. 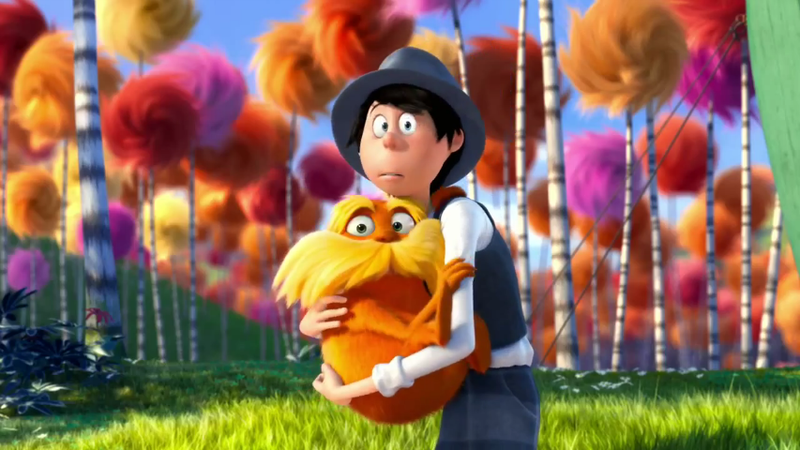 The Lorax surpasses even the highest expectations, and once it has finished I defy anyone not to sit down right away and watch it through it all over again.